Think of rooSwitch as an app that lets you perform user switching at the application level. Instead of logging in and out of different user accounts on your Mac, rooSwitch lets you switch users for only one app at a time by switching what rooSwitch calls Profiles. Created for beta users and software developers to create multiple user scenarios, rooSwitch is evolving for use by typical users as well. For example, I have a group in my Address Book that contains e-mail addresses for mailings. I created a user account to separate the e-mail group from my regular Address Book contacts, and used rooSwitch to switch between the two Address Book accounts. (I must remember to have the proper profile open when I sync my iPhone.) You can use rooSwitch to manage proxy settings in Firefox, or to switch Final Cut Pro setups. 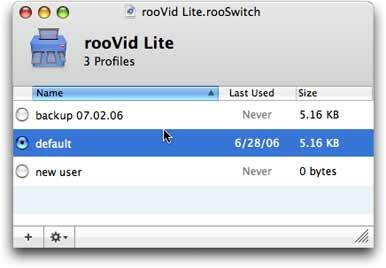 You can also use rooSwitch to manage iPhoto libraries but, due to the issues of its large libraries, that gets complicated—iPhoto Library Manager is better designed for that. To set up a first new Profile for an application, you drag the application’s icon to the rooSwitch window or onto the rooSwitch Dock icon. You then create a Profile, which automatically reflects the current state of that app. Next, to create a new scenario, start a new empty Profile, then click the new profile name and allow the app to quit and re-launch. This presents the app as if you were using it for the first time, so you can set it up for your other situation. Another option is to duplicate your existing Profile and just make changes instead of starting from scratch. To switch Profiles, the rooSwitch window for each managed application must be open, or you can launch its file in Application Support. RooSwitch works with nearly all programs, supports Automator and AppleScript, and lets you view multiple rooSwitch documents (application controls) simultaneously. RooSwitch is a powerful application. It can be an excellent tool for developers and beta testers. However, it’s not for novices. If you understand your Mac or work with someone who does, you might create some very helpful workflows with it.